I can scarcely believe that exactly 40 years ago, I embarked upon a journey that would have a profound effect on the rest of my life. 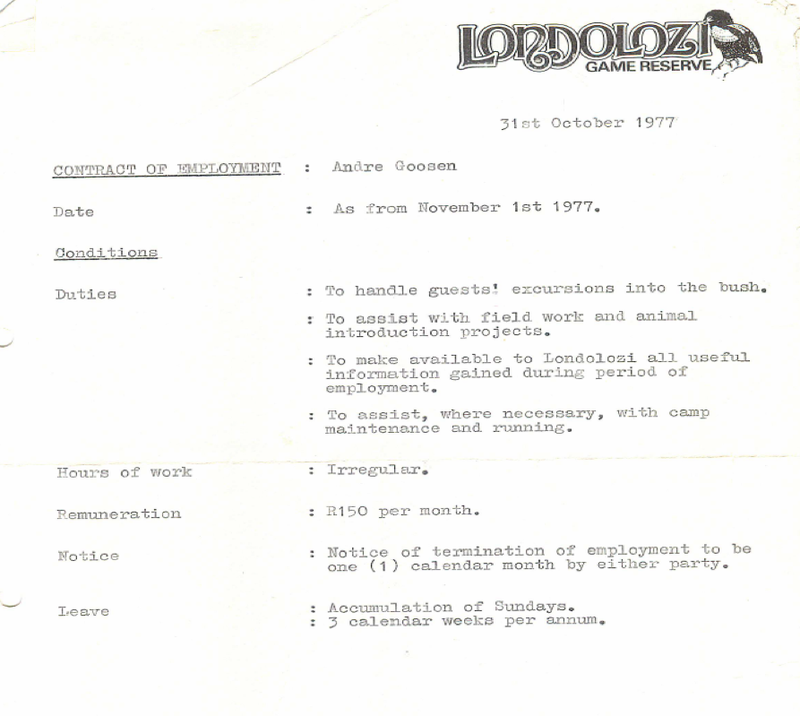 On the 1st November 1977 I started work at Londolozi Game Reserve as the Junior Ranger. My employment followed a short interview with John and Dave Varty (with a brief reference from Ian Thomas) following a letter of application I sent to them a few months earlier. Arriving at the camp, I immediately fell in love with Londolozi, my new home for almost 2 years. 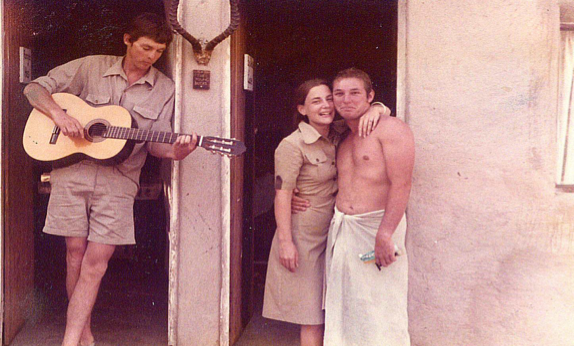 Of course, Londolozi 40 years ago was a very different place to what it is now. Things were very rough and we operated pretty much on a shoestring. 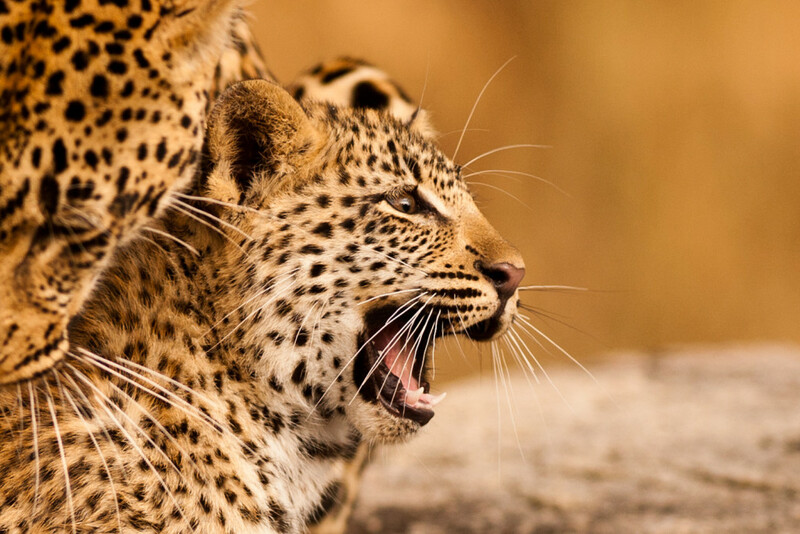 Londolozi was one of only two commercial lodges in the Sabi Sand Game Reserve. There was only one lodge at that time consisting of the original four rondawels and two chalets which had only just been built. When I arrived, our first task was to build a swimming pool, literally by hand. 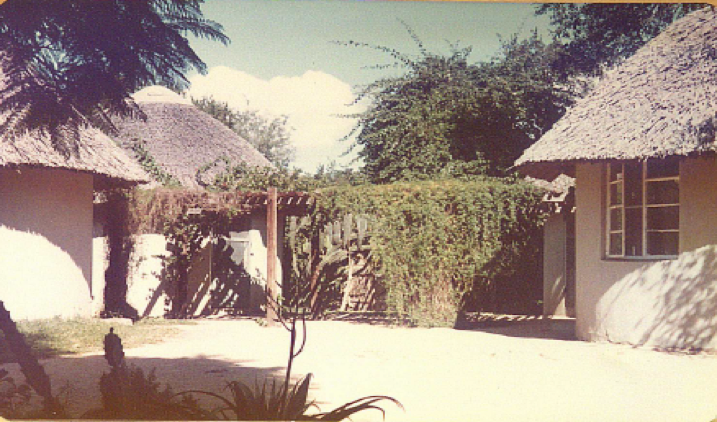 The 4 Rondawels – Original Londolozi Lodge. 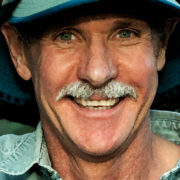 There were only two other Rangers, Mike Myers and Lex Hes and the three of us together with John and Dave Varty were responsible for running the camp, game drives and any other work that needed doing. Lex and Mike relax before a game drive. 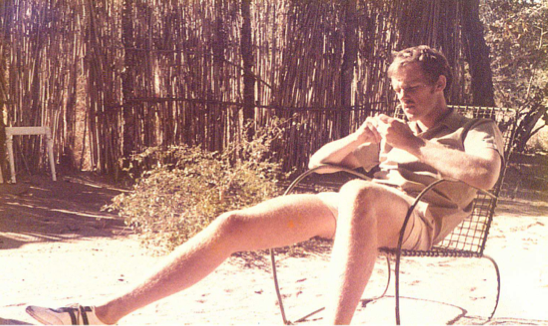 Dave Varty deep in thought between game drives. 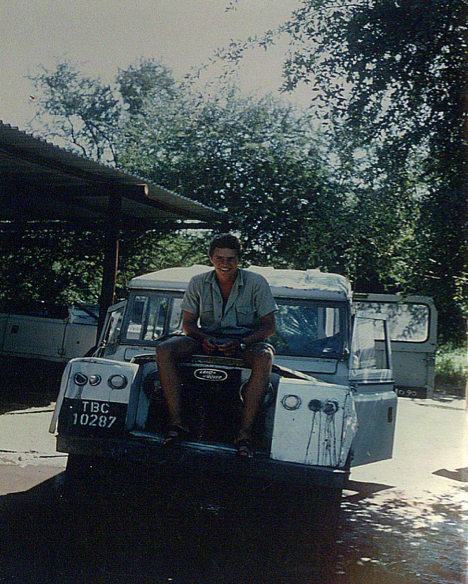 Our game drive vehicles were very old and would break down on a regular basis. It was not uncommon for guests to have to assist with mechanical repairs, push starting vehicles and certainly on many occasions, assisting with Landies that had been bogged down on the very rudimentary roads. Death of an old lady – “TBC” with broken chassis. 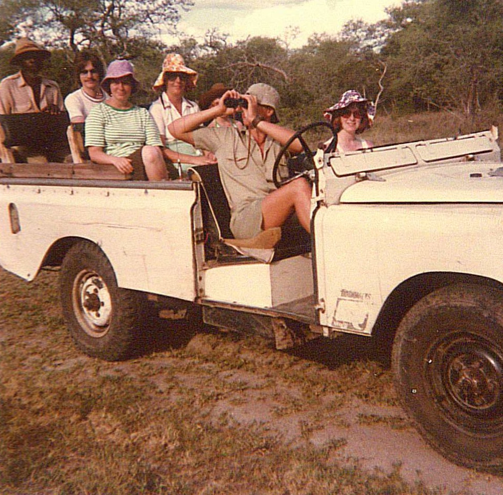 Original game drive vehicle – note the wooden seats! 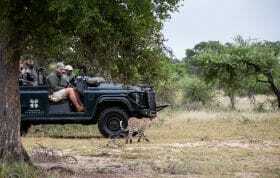 The Camp was not always full and so usually one or two game drive vehicles would be out at any one time. We had traversing rights on some neighbouring properties including Charleston, Toloun and Ottawa. In those days, there were no bridges or causeways across the Sand River and crossing points had to be carefully selected and only when the water level was low. I recall that on New Years Day 1978, the river came down in spate and we were only able to cross it again in May, some four months later. You can imagine how overgrown and wild the areas on the other side of the river were when we finally made that crossing. 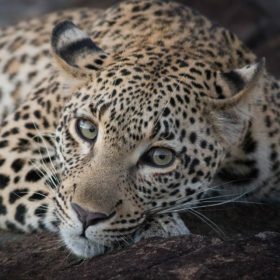 Londolozi is now renowned worldwide for its leopard population and incredible leopard sightings. 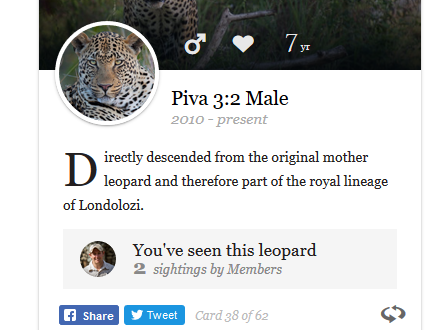 When I worked there, leopard sightings were fleeting and somewhat of a rarity. Because there was still a fence between the Kruger National Park and the Sabi Sands, there were no breeding herds of elephant in our reserve and only old elephant bulls would visit us periodically on the way to or from a raid of the citrus plantations at Lisbon. During my time there, we were very involved in an elephant translocation project involving young elephant females, in an attempt to build up a breeding herd in the Sabi Sands. 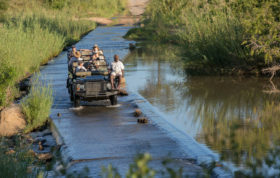 Much of our time was spent creating new roads and access points for game drives. 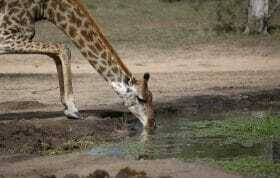 The Londolozi camp had no electricity other than a small generator used mainly to power the ice machine. Lighting and other power requirements were in the form of paraffin or gas. 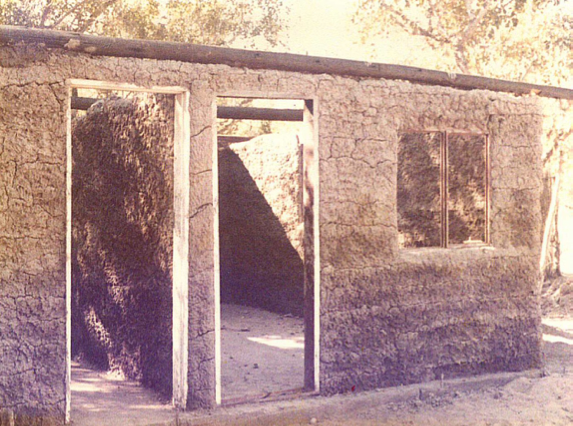 The rangers accommodation consisted of “wattle and daub” shacks which we built ourselves and one old prefab hut which had a door missing and the space between the rafters and the roof was frequently used by all kinds of creepy crawlies to gain access. Staff quarters work in progress. Lex had an African Grey parrot named Spike (after Spike Milligan) who would wander around the staff quarters causing mayhem and generally eating everything but his sunflower seeds. Sadly Spike met his demise courtesy of a Genet one fateful day. My first house – the infamous prefab. Londolozi had no airstrip and guests either arrived by car or flew into Skukuza where we had to collect them in whatever vehicle was available. Meeting guests at Skukuza airstrip. 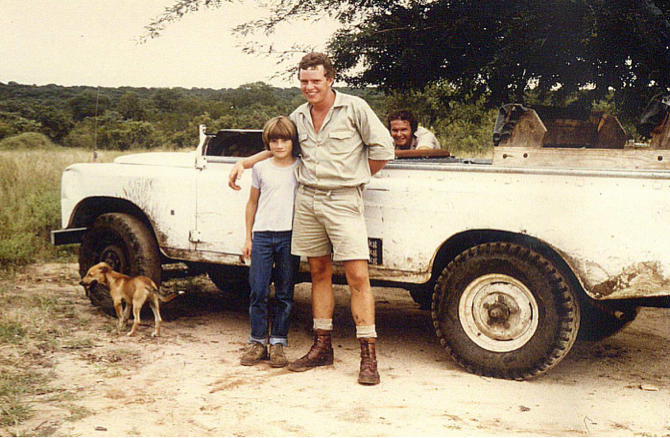 In my time at Londolozi I met many fantastic people, some of whom I still have contact with to this day. 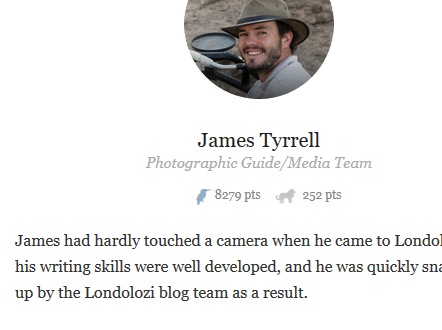 Earlier, I noted that my experience at Londolozi would have an effect on the rest of my life. Indeed, during my time there I met a guest who said that if I ever left Londolozi for whatever reason, I should contact him for a position in the company that he ran. When I finally did leave Londolozi I took him up on his offer and shortly thereafter, joined this large Engineering Merchant, supplying piping, valves and pumps to industry, as a trainee. My career with that company included a stint in Nelspruit where I was tasked with opening a branch for them, supplying goods to the irrigation engineers and other mines and industries in the Lowveld. 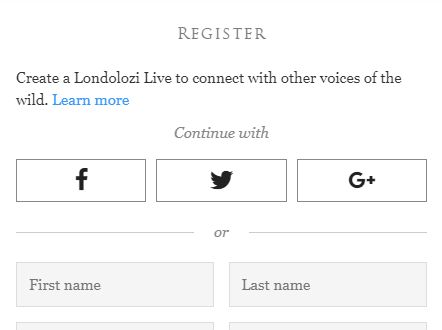 Londolozi became one of my best customers and I would regularly deliver a load of piping and plumbing materials to them on a Saturday morning, staying over night with one of my friends in the staff quarters and returning to Nelspruit on Sunday afternoon. My career with that company has taken a number of roads and today I run an operation that was linked to them many years ago. 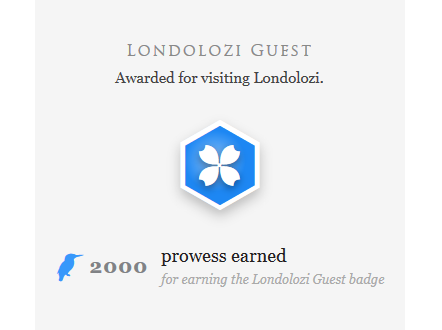 So, I owe my success to Londolozi and the people I met there. Although I currently live in Johannesburg, my first love is still the bush. 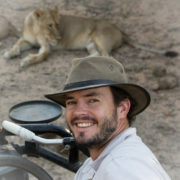 I am privileged to have visited Londolozi and the Sabi Sands on numerous occasions since leaving there all that time ago. I spend as much time in the bush with my family and friends as I possibly can. It is great to have been a part of what is today a Internationally respected reserve. 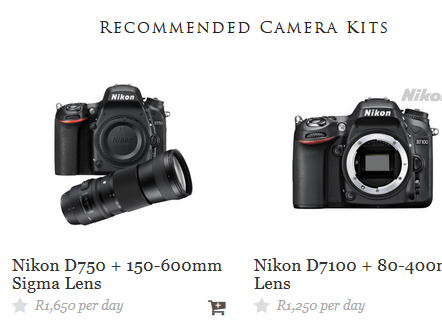 I follow your blog daily, with keen interest. I loved reading your blog Andre. I love history and reading stories about life in the bush. Those pioneering days were the best. We’ve been in White River for 30 years and my husband was born and grew up in Nelspruit. This is an amazing area to call home. 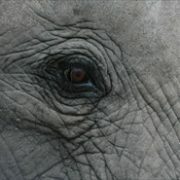 We are so privileged to be so close to Kruger and the surounding wild life areas. How nice to hear from someone who worked there at the beginning. 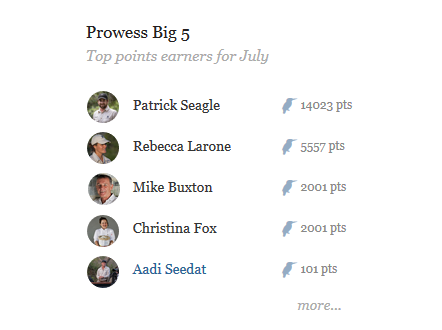 And nice to see the other two rangers, esp since I have met Lex Hes as co-owner of Ecotraining. And a great photographer! What a great story !! 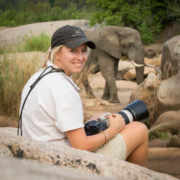 You have been blessed with a magical life, starting out as a ranger and then taking the opportunity offered to move into the business world, yet you managed to use that position as a doorway back to Londolozi. Well done. Albeit the new lodges come with all the bells and whistles but I bet the olden days were much more exciting as far as untold adventure. 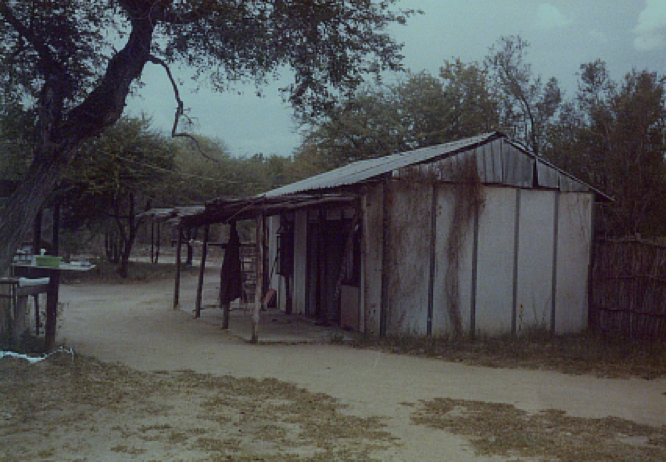 My first trip to Southern Africa was in 1996 and I stayed in a small camp in Zimbabwe with no power, save for oil lamps and 6 army style tents. Had the best time!! 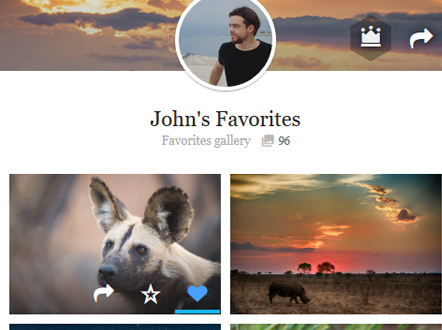 Really interesting to see how much things have changed in Londolozi over the years! 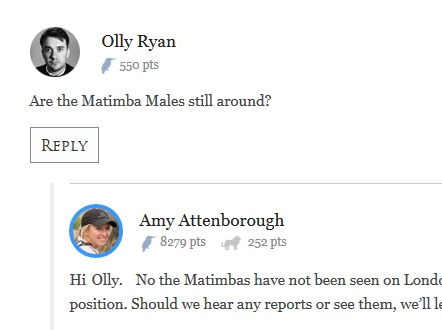 Wasn’t this close to the time that John Varty and Elmon Mlhongo made the film The Silent Hunter? Hi callum. It’s quite extraordinary isn’t it?! This was pre-silent hunter though. We think John and Elmon filmed Silent Hunter in the late 80’s. Thanks so much. Ah okay, that actually makes sense. I managed to get a video of the Silent Hunter at a second hand sale a few years ago and it really was ground-breaking footage for that time (I assume that that was the Mother Leopard that they filmed). 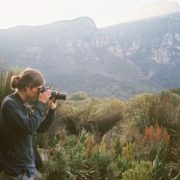 I’ve also got a book called My Life with Leopards by Fransje Van Riel who also worked with John and Elmon on a different film in Londolozi. Thank you. Wonderful memories. 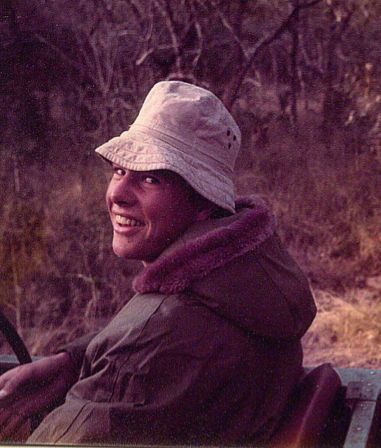 First visit to Londolozi was in 1982 (maybe’83.). 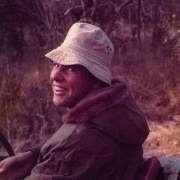 Lex and Lynn managed Bush Camp. I’m counting days till another return visit….my 5th since 2010. My heart rests in Londolozi.? So interesting to read a bit of the history of Londolozi. Loved the pictures. Seems like a very special place. Fantastic pics! Its fabulous to be able to look back and see what has been achieved by all in the last 40 years!!! Your story brings back so many stunning memories and lots of nostalgia. And well done for keeping the pictures, they add so much detail. Even though the place and vehicles etc have changed so much, I find that the look on peoples faces remain constant. Thank you for this Andre. 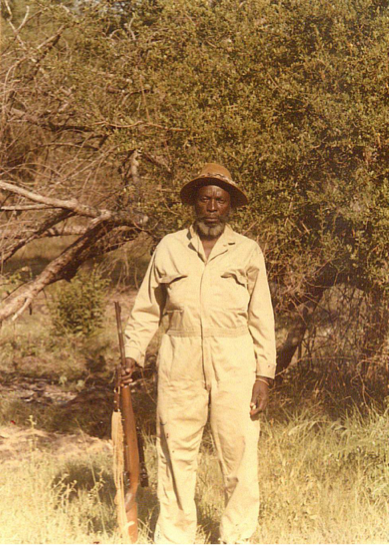 This slice of Londolozi history was a lovely read. How amazing to think of all the hard work, people and vision it has taken to create such a wonderful partnership with nature and share it with so many. One of the best blog posts I’ve read. 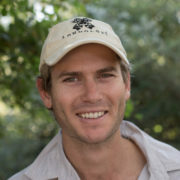 Your love and passion for what Londolozi is, is very apparent. 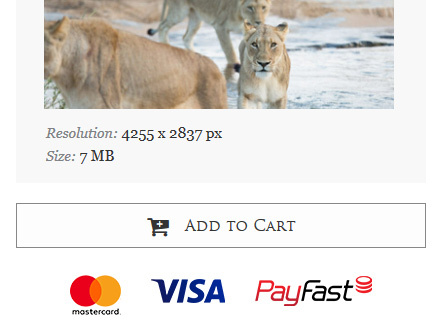 This is incredible – I love seeing how Londolozi looked way back when. What an experience it must have been, thank you for sharing!